If your heating system has only two wires, the job of the thermostat is simple. All it has to do is turn the heat or the cooling on and off. There's no auxiliary fan to worry about and no heat pump. There is also no thermostat blue wire, or common wire, to power the thermostat, so it has to operate on its own, either using batteries or mechanical temperature detection. The Honeywell T87F and CT87A thermostats are good choices for such a system, which might involve a wall-mounted propane heater, an electric heater, an oil furnace, a swamp cooler or an electric air conditioner. They have mechanical temperature sensors, so they don't need batteries, and they are easy to mount. When you remove the cover from the old thermostat, you should be able to see the wires connected to terminals on the base plate. The wire colors should be red and white for a heating system or red and yellow for a cooling system, but that's only if the installers followed the color code, and they might not have done so. Honeywell recommends that you ignore wire colors and label each wire with its terminal designation. That way, you'll be sure to wire the new thermostat in the same way that the old one was wired. The voltage passing through the wires is at 24 volts. It's not enough to be dangerous, but it can give you a shock, so be sure to turn off the power to the heating or cooling appliance before handling the wires. After labeling the wires, it's safe to remove the old thermostat by unscrewing the mounting plate from the wall. Be aware that old thermostats sometimes contain a mercury bulb. Handle it carefully and dispose of it as hazardous waste. The new thermostat has to be mounted level for the temperature sensor to work properly. The mounting plate has two leveling posts on which you can rest a torpedo level. Center the bulb on the level and secure the mounting plate to the wall or an electrical box. Don't forget to feed the wires through the wire opening first. Since you labeled the wires when removing the old thermostat, you can simply connect them to the same terminals on the new thermostat. On a heat-only system, one of the wires (usually red) goes on the R terminal, and the other wire (usually white) goes on the W terminal. In a cooling-only system, the wires go on R and Y instead of R and W. The wire for the Y terminal is usually yellow. Check the Honeywell thermostat wiring diagram in your owner's manual for more details. 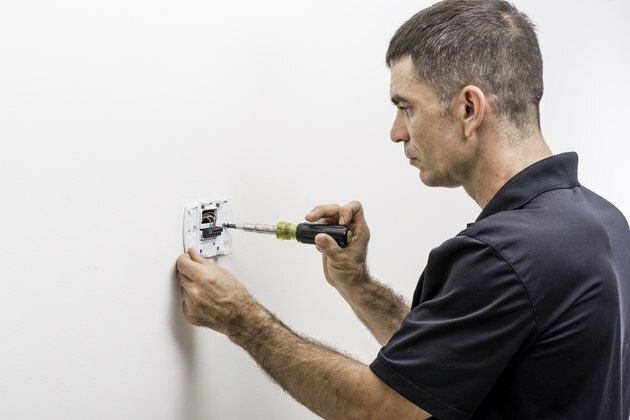 Connect a wire to the terminal by either inserting it straight between the screw and the contact plate or wrapping it clockwise around the screw. Tighten the screw down with a screwdriver and install the cover plate according to the instructions in the manual. When you're done, turn on the power and test the thermostat. If it controls heating, turn it to the highest setting and make sure the heat comes on. If it controls cooling, turn it to the lowest setting.